Despite being part of a series of victories in 1862, the “Page Grays” of Co. H, 33rd Virginia Infantry, had seen their fair share of desertions (not, by any means, that the “Grays” were slackers, as the company also saw more than its fair share of casualties in some of the hottest contests of the war… and was regularly designated the color company for the regiment, quite possibly an honor bestowed upon the company for their part in taking the guns at First Manassas). While in winter quarters, and during the high tide of courts-martial in Stonewall Jackson’s Second Corps, those desertions caught-up with the company, and more than a few charges were brought to courts-martial. Seven men were sentenced to death, while eleven others were sentenced to a wide array of punishments, including the laying-on of 25-39 lashes across a bare back. Four of those sentenced to death were fortunate enough to evade execution because of technicalities; specifically, the courts-martial recorder had improperly maintained a complete record of the courts. In the end, however, Gabriel L. Price , Andrew J. Knight [note 1], and William Pence were not among the luckiest men. I have the good fortune of knowing more about Pence’s story than that of the other two. Pence had actually deserted at Elk Run [in the vicinity of Conrad’s Store] on April 20, 1862, as Jackson was gearing-up for the best days of his 1862 Valley Campaign; but didn’t show-up again in the muster rolls until December 21, 1862, when he was recorded as having “joined from desertion”… and, by the way, the “joined” part is not indicative of a voluntary event. Also, Pence had just “enlisted” on April 5… so his quick desertion seems to reflect another story altogether, regarding enlistments immediately following the enforcement of the first Confederate Conscription Act… but that will be a story for another time, perhaps. 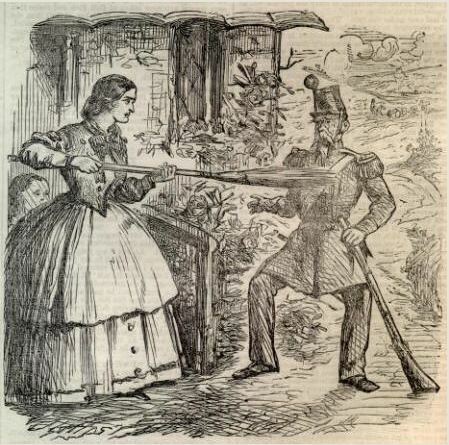 Clearly, Rebecca Pence was not like the Southern woman portrayed in this image, refusing to let her male relative into her home because he had deserted his unit. Pence… lived with his wife on the Pike, a mile West of Stanley. She was Rebecca Short, a daughter of the late ‘Dickey’ Short, by his first wife. They were law-abiding people. When the officers came to take him, she would not let them in the house, but they forced an entrance and the wife became so enraged that she hit one of the officers over the head with a frying pan. He told her for that act she would be sorry as long as she lived. They then went away taking Pence with them and he, with the other two was booked to pay the penalty. 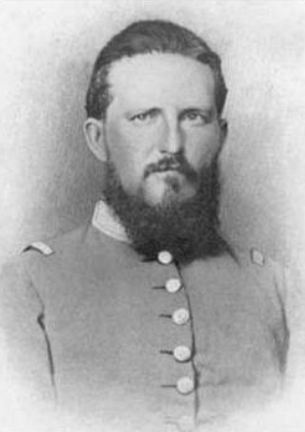 Despite the sentence, Stonewall Brigade commander, Gen. E.F. Paxton, intervened. It may be that Paxton’s actions were the result of appeals made by, as Coffman put it, “influential citizens” of Page County, who “went to work to bring about his reprieve”. Paxton did note that with all three of these men being from the same company and county, the execution of the three might bear some undesirable implications in discipline and morale in the “Grays”. In lieu of the execution of all three, Paxton recommended that the men be allowed to draw lots, leaving only one to be executed. Not one for leniency in these matters, Jackson did not endorse the idea on the routing slip, and forwarded the paperwork to Gen. Robert E. Lee, who, in turn, agreed to Paxton’s recommendation. Lots were drawn by the three men… and Pence became the unluckiest of the unlucky three. On February 28, 1863, the execution was carried out… and documented by some who watched. Map-maker Jedediah Hotchkiss wrote simply that “A deserter from the 1st Brigade was shot today, and one escaped yesterday” [though I also recall finding, somewhere, that Hotchkiss remembered that Pence “wept bitterly, wishing to see his family”]. … we went up to the stake playing the Dead March… When we got to the place the men that were carrying the coffin put it down by the side of the stake and the condemned man sat upon it leaning against the stake. the preachers sang and prayed and then shook hands with him. Pence was taken out in a field and set on his coffin, back of which a stake had been driven, his hands tied back of him and to the stake and while the band played that old familiar hymn, ‘Oporto,’ found in the old Harmonia Sacra, beginning with ‘Come Hither Ye Faithful,’ etc. ; twenty men were drawn up in line, some twenty steps off and each man was handed a gun, ten supposed loaded and the other ten primed only, so in this way it might be known, who shot him. When asked for his last statements, Pence asked to see his brother; a request that was not honored. 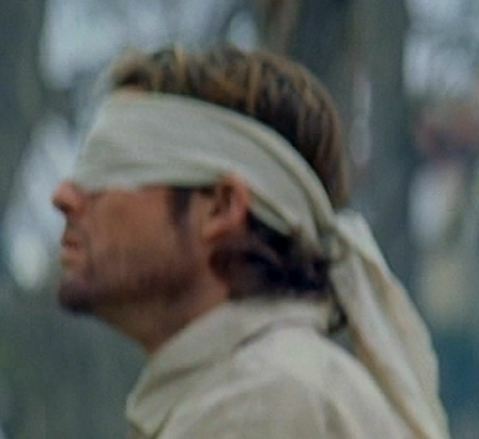 ... but, in all three accounts, there was no mention of a blindfold. Again, Pence was asked for a last statement, to which he replied, “No, nothing.” When the order to fire was given, Pence “threw up his hands and fell over. He did not speak after he was shot, he gasped for breath twice. His last words were “O, what will my poor wife do…” it was just three weeks since William’s seventh wedding anniversary. A shallow grave was dug and they buried him, notifying his relatives… Henry Pence, a full brother, who was at that time in charge at the Gibbons Mills, now the Willow Grove Mills, South of Luray, together with Frank Short, a half brother of Rebecca Pence, went with a two-horse wagon and brought the body home. I went to see him after he was laid out and he had a very peaceful look. The late T.M. Offenbacker [… and here’s the first family link to this story… Offenbacker being my third great-grand uncle], cut a bullet out of his wrist and it may have been found among some of his effects after his death. And now comes a part of this story that some have felt inclined to doubt, but we have it from the mouth of two witnesses, the way the truth is supposed to be proven, for both Pence and Short vouched for the story. They said on the way home with the body as they came to the foot of the Ridge, on the Madison side, night came upon them, and as it was raining very hard, they pulled aside, unhooked the horses and after giving them hay, they lay down under the wagons, not for a bed, but to keep out of the rain and just as all was quiet, the voice of a man was heard singing directly over the wagon and little higher than the tops of the trees and continued to sing until the break of day. As they began to hook up, the singing ceased. They said it was beautiful, but only one hymn, and it sounded very much like Pence, the dead man. So, in the end, we not only have a sad story surrounding an execution, but also a ghost story… and was there also the hope of a curse fulfilled? Mrs. Pence said that her prayer was that all three of the men that had a hand in bringing about her husband’s death, might be killed before the war ended. Now I knew all three of the men she held responsible, and the one, a captain, was soon shot in the forehead and killed instantly; the next one, a lieutenant, was shot in the throat and killed instantly; the third man, also a lieutenant, was shot through the lung and lingered a while, but died; thus, Mrs. Pence claims to have had her prayer answered. She afterwards married Wm. Flemmings, of Leaksville, where both lived for many years and passed on. Were Rebecca Pence’s prayers really… curses? Among the three indicated officers who met death, we have… yet another family tie in one of my third great grand-uncles, Captain Michael Shuler… and one of my distant first cousins, Lieutenant Oliver Hazard Perry Kite. Shuler was killed “instantly” (and, yes, I believe he may have been shot in the forehead) at the Wilderness on May 5, 1864. 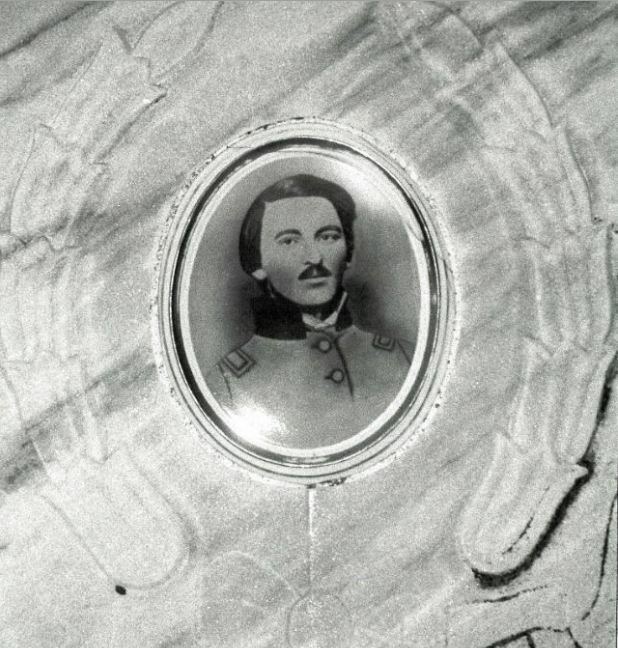 Kite was seriously wounded in the chest on May 10, 1864, and “lingered”… dying on the one-year anniversary of Shuler’ death, May 5, 1866. As for the other lieutenant, who was shot in the throat and killed instantly… I can’t seem to pinpoint who this may have been. Ghosts and curses? What do you think? 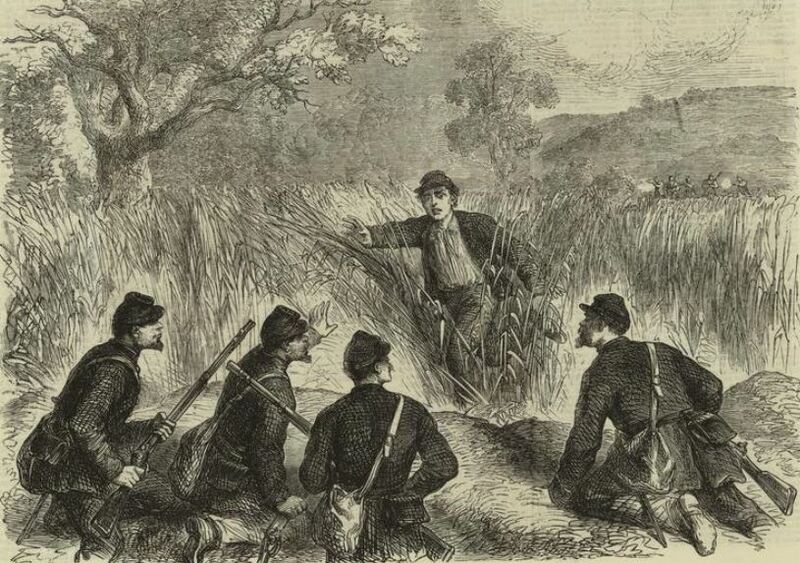 A Confederate deserter entering Federal lines. Andrew Knight, [was] of the Mountain district near Mauck. He was a brother of Jacob, George and Jack Knight. I do not think he sought a reprieve but took a chance in the dead hour of night and got behind the tent of the guard house and slipped through a wagon train parked just back of it. He made for dear life for such it proved to be to him. He made his way to Media, not far from Philadelphia, where he worked on a farm until after the war, when he came back home and took his family back with him, where he stayed until the death of his wife, after which he came back to Page county and later on went to Baltimore, where he married the widow of Jas. Knight, but died about two years later. Robert, thanks for the inspiration. If you have time, check on this first person account of the death of William Pence. I’m fascinated with your “Re visiting Ghost Story…” blog of Oct 2011……Jacob, James Harvey, and Cumberland George COFFMAN are my G Uncles, with Reuben Yancy, their brother, being my GGF. It’s hard to tell if they were Unionists all along. It looks like they enlisted early on. Also, Co. H, 33rd Va. saw a lot of hard service… enough, I think, to make some declare when enough was enough. glen nauman was at grandmas funeral last month. hes 94 years old but still has his mind and gets around. I will call him when I get a chance and ask him about what he can remember about page county and the families involvement in the war. he will know. I do know that none of the offenbackers held slaves. a couple of the naumans had some slaves and some of the Huffman side of my family held slaves. my dad has a hand written book rena Huffman wrote about the civil war. huffmans held slaves and were confederates. her momma died and a slave man named noah carried her for three days and never set her down. she called them darkies. when the war was over the slaves didn’t want to leave the Huffman farm. they weren’t whipped and mistreated like most slaves are portrayed in movies. they were like family. I will ask glen which naumans had slaves. I can tell you that as far as the offenbackers are concerned we weren’t slave holders and I don’t think anyone in my family would do that to another human being. the issue was simply that when you live in northern Virginia and people are shooting in your back yard and having battles all around page county you tend to pick up a gun and protect where you live. sometimes a man doesn’t have choice whether you believe in the cause or not. we married a lot of nauman girls and the naumans and offenbackers came hand in hand to holt county Missouri and remain close to this day. I always remember the old timers were very strongly politically opinionated and getting the nauman and offenbackers and mavitys started on a political debate at a reunion could get pretty heated. but as far as our involvement in the war it was more geographical and self defense in nature.